You drive, traffic generates sales, sales generate profit, profit satisfies your vested interest and stimulates to work more to drive traffic again. It seems to be the vicious circle of a homeless junkie, though, that’s how e-Commerce business for store owners works. It doesn’t matter how big your traffic flow is already -- zero or 10,000 visitors per day -- driving more targeted audience will always be a crucial part of growing your business. To help you with that, we’ve prepared 5 proven strategies to drive traffic to your online store. Facebook is the largest social media platform filled with opportunities to drive traffic and reach your customers` potential basing on their location, gender, interests, behavior, etc. Facebook is good at retargeting with their so-called Dynamic Ads that send automatically-generated ads to customers featuring products they were striving to find at your online store. If you’re targeting millennials, there’s hardly any better social platform to advertise on than Instagram. If you already got an army of followers on this popular photo sharing network, without thought-out advertising campaign you’re not using its potential to the fullest extent. You need to consider the fact that Instagram is mostly browsed on mobile devices. Make sure your store is responsive and mobile-optimized to get improved conversions. Another social media platform popular among millennials is Pinterest, one of the most successful social commerce network and the home for Promoted Pins. It’s famous in niche groups as DIY crafts, fashion and decor, and often said to play a key role in the purchasing decisions of its users. Pinterest claims that 93% users have used it to plan their purchases and 53% purchased something online after seeing it on the platform. The simple truth is: you can not drive traffic without good SEO. When users search for the kind of products you’re selling, you want your store to be at the top results on Google. Robust SEO strategy is the guarantee of a substantial, permanent traffic flow to your store: neither paid advertising nor featuring your store on New York Times won’t give you that ever. Based on some recent studies, the top organic result on Google search receives 30% of all clicks exclusively -- others just don’t even get a chance. Good way to optimize your store for search engines is to learn the rules and principles that govern Google / Bing work and adjust your website content accordingly. Ever seen your favorite YouTuber or blogger featuring any kind of product / service and sharing link to store you can purchase it from? Well, that’s influencer marketing - using a notable person (at least in some quarters) to promote products among his or hers audience. The trick here is that those influencer’s fans genuinely trust them (unlike other forms of advertising), thus can be easily convinced to try out a product or visit the particular website. Fun and informative content doesn’t push people away by being intrusive and drive more engagement than any other form of promotion. People love free stuff and there’s a way to leverage that fact. Contests along with giveaways are great strategies for short-term traffic increment you may get from both current and new customers. Using social networks in terms of entry method would be a smart choice, since it increases the chance of your contest to go viral among users and receive greater exposure. Once customers are in your store, you can use popups to guide them to your product pages. Interesting, engaging and informative content is what lures users and drives organic traffic to your store. However, content marketing is not just about having a blog: videos, podcasts, guides, ebooks and infographics - all these will open new opportunities and capture new audiences. Original and professional content helps you position your brand and store as an industry thought leader and build customer loyalty. By creating content on all topics that your customer might find useful, you get chances to win search results beyond product and brand keywords only. These are a few proven strategies to increase your traffic. Every opportunity to seize more targeted people visit your store is gold, make sure you don’t miss any of them: guest posting, webinars, sales, AdWords and many more. 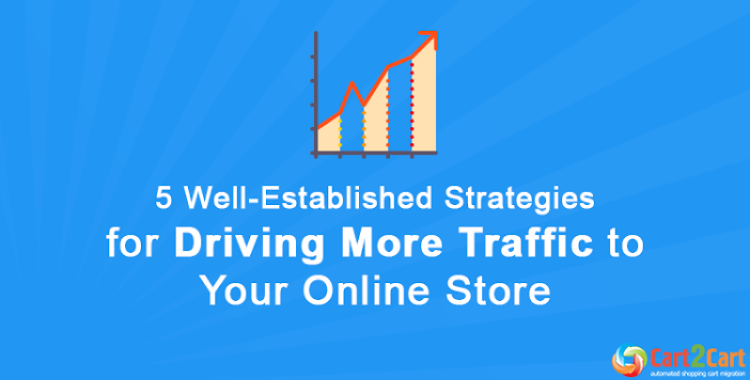 What do you do to drive traffic to your online store? Will be happy to know your answers in comments section below!